A loud school cafeteria can typically land someone in trouble, but Thursday morning the noise at Pine Street Elementary was not only encouraged, it was educational. 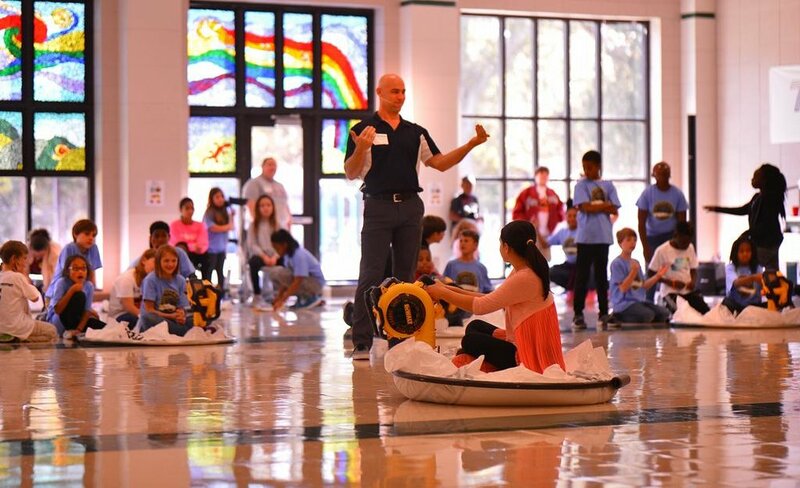 The school’s fifth-grade students took to the cafeteria for lessons in science and teamwork with Matthew Chase of the Hovercraft Project. The national nonprofit visits schools, providing the materials for students to build and race vehicles that slide across the floor, mimicking hovering. “Seeing how excited they are was fun, but seeing the leaders emerge from each of those groups was really cool,” said Susan Gilstrap, a teacher at Pine Street Elementary. Students were put into groups of seven or eight and given the tools they’d need for the hovercrafts: a metal, circular frame with a hard plastic top and inflatable bottom, and the engine of a leaf blower. When put into place, the engine blew air into the contraption, allowing it to almost float across the smooth cafeteria floor. The sounds of the students pushing and riding the crafts, along with the noise of the crafts themselves, filled the school’s cafeteria for much of Thursday. The event was made possible by the Pine Street School Foundation, a nonprofit organized by school alumna and parents. The group raises money each year to fund teacher grants, and the Hovercraft Project experience was one of this year’s efforts. Chase led the students through heats of races featuring multiple riders or one rider and multiple students pushing the hovercrafts. Once students were done, teachers even got to glide around with the help of their students. “It really was phenomenal,” Gilstrap said. Fifth-grader Isak Jackson said the races gave students the chance to analyze where to sit on the board and how hard to push it. If the craft floated too far, they didn’t win. Students had to use principles they learned in science and technology lessons to figure out how to most efficiently build their crafts. The groups were organized around team leaders, who delegated tasks during each heat of races. Chariya said the lesson in teamwork is one she’ll take with her through her education.